Now available in Ecco’s Art of the Story series: a never-before-published collection of stories from a brilliant yet little known African American artist and filmmaker—a contemporary of revered writers including Toni Cade Bambara, Laurie Colwin, Ann Beattie, Amy Hempel, and Grace Paley—whose prescient work has recently resurfaced to wide acclaim. Humorous, poignant, perceptive, and full of grace, Kathleen Collins’s stories masterfully blend the quotidian and the profound in a personal, intimate way, exploring deep, far-reaching issues—race, gender, family, and sexuality—that shape the ordinary moments in our lives. In “The Uncle,” a young girl who idolizes her handsome uncle and his beautiful wife makes a haunting discovery about their lives. In “Only Once,” a woman reminisces about her charming daredevil of a lover and his ultimate—and final—act of foolishness. Collins’s work seamlessly integrates the African-American experience in her characters’ lives, creating rich, devastatingly familiar, full-bodied men, women, and children who transcend the symbolic, penetrating both the reader’s head and heart. Both contemporary and timeless, Whatever Happened to Interracial Love? 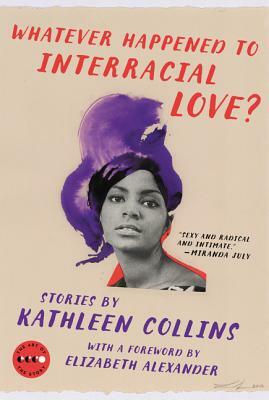 is a major addition to the literary canon, and is sure to earn Kathleen Collins the widespread recognition she is long overdue. “[A] lost treasure... this jewel of a book illuminates big timeless themes of familial ties and self-determination, group affinity and individualism, lovers and the power plays between them in a way that feels completely new.”. Kathleen Collins writes with an immediacy and vividness that is exhilarating to read. She inhabits a landscape that sidesteps political or sexual correctness in favor of emotional truth-telling...Throughout it all there is a brio that is contagious.